Grab your pot and filé and get ready for a delicious Cajun read with your little one. 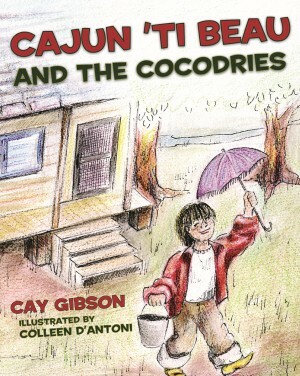 Cay Gibson has adapted a classic trickster tale to tell the story of young boy who lives with his Mama and Papa along the Atchafalaya Basin. When ’Ti Beau goes for a walk while wearing his fancy new clothes from the Mardi Gras festival, he attracts the attention of the swamp’s alligators, who threaten to sauté him and turn him into sauce piquante! But ’Ti Beau is too clever for these five cocodries. He trades each gator a piece of his fancy clothes for his freedom, but what happens when the alligators get into a fight about who is the handsomest, grandest, swimmiest, fanciest, and spiffiest gator of all—and ’Ti Beau’s caught in the middle? Complete with a French to English glossary, this book is perfect to read to your little ones before they fais do do. For dinner, you can fill your bellies with the same meal as ’Ti Beau using the Alligator Sauce Piquante recipe included! Cay Gibson is an author and frequent lecturer on fiction, education, and spirituality. Her writing has been published in numerous educational and religious periodicals. A home educator for the past eight years, Gibson lives in Sulphur, Louisiana, with her husband and five children. Colleen D’Antoni is a freelance artist and student at the Savannah College of Art and Design. She has earned first place in numerous art competitions, including the Congressional Art Competition. Raised near New Orleans, Louisiana, D’Antoni is an active volunteer, working with mentally handicapped children through the Circle of Friends organization. You and your child will delight in the crafty thinking of 'Ti Beau. The young boy in the story outwitted some alligators who wanted to cook him into a sauce piquante.